Horror Movie Bow Ties: So we stumbled across these awesome Horror Movie Bow Ties on Etsy by the very talented ‘The Vintage Beau‘ who specialise in hand crafted bow ties made from vintage, themed, and reclaimed fabrics. Here’s Johnny!!! 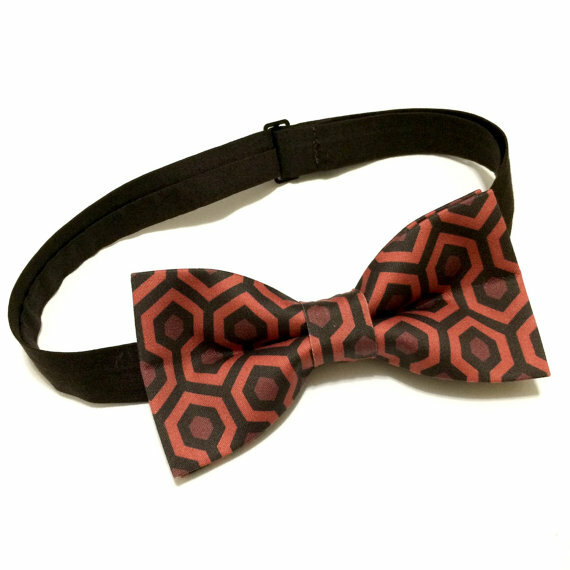 The Shining inspired pre-tied bow tie will be the perfect addition to your wardrobe or horror collection. First date, a wedding, being a hotel caretaker for the winter… this bow tie is perfect for any occasion. Each bow tie is handmade with an organic cotton that has a nice shine to it. Be dressed to kill! This bow tie features a repeating image of Jason Voorhees over a dark green background printed on an organic cotton sateen. Perfect for any occasion, you can dress it up or wear it down. It can also be accessorised with a machete, pitchfork, axe, etc. Be truly unique in this amazing creation from The Vintage Beau. Camp counselor tested, mother approved. Fabric designed by Travis Falligant. One, two, Freddy’s coming for you! This shockingly awesome bow tie features the famous red and green sweater stripe over a knit design. It also features Krueger’s burnt skin coming through several slash marks on the sweater design. Both fabrics printed on a high quality organic cotton sateen. Perfect for any occasion, you can dress it up or wear it down… or just wear it while you haunt teenagers dreams. Be truly unique and indefinitely sleepless in this rad creation. Fabrics designed by Travis Falligant. Each bow tie is unique and no two are alike. Placement of stripe and slashes will always slightly vary. Be dressed to kill at any occasion with this stylish and scary pre-tied bow tie. Each Michael Myers bow tie is handmade with an organic cotton and nice shine to it. The fabric was designed to perfectly display this amazing image and you will not find it anywhere else. They’re heeeere… Be dressed to haunt at any occasion with this stylish and unique pre-tied bow tie. This bow tie features a retro television static print which was inspired by the movie Poltergeist. Perfect for any occasion, you can dress it up or wear it down. Stand out in this truly unique creation. Be dressed to kill with this stylishly bloody pre-tied bow tie. Each bow tie features a blood splatter design over a white cotton. Perfect for any occasion, you can dress it up or wear it down. Be truly unique in this rad creation as no two bow ties are alike and the blood spatter design will always vary.